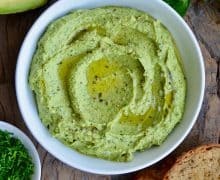 What’s low carb, packed with veggies and trending all over? 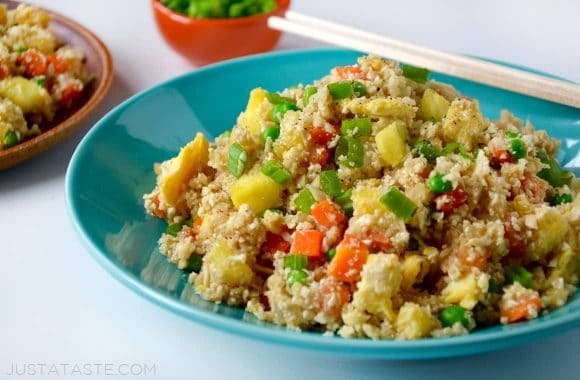 Cauliflower fried rice! Well, to be more accurate, it’s more like “rice” because this healthy alternative to takeout ditches the starch in favor of a cruciferous alternative. But have no fear! If a food processor is not among your culinary gadgets, you can also use a box grater to grate the cauliflower florets into a rice-like consistency. Once your cauliflower “rice” is ready (no need to pre-cook it! 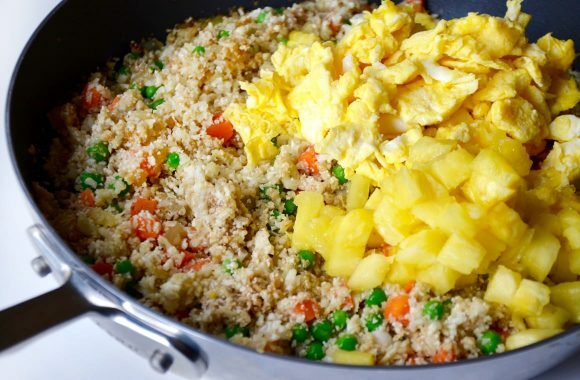 ), all that’s left to do is follow my favorite fried rice recipe that’s loaded with fresh garlic, onions, veggies, eggs, and a sweet addition, pineapple. In all honesty, I was a bit of a skeptic to try cauliflower fried “rice.” I’m a starchy kinda gal and I couldn’t imagine my husband (who counts fried rice among his favorite foods) would possibly be swayed by this total takeout-fakeout. Color me surprised! 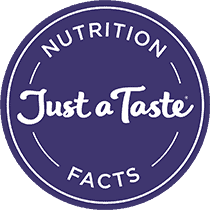 One taste and he blurted out, “It’s actually really good!” We were both shocked by just how similar the flavor of cauliflower fried “rice” (#quotationmarkoverload) is to traditional fried rice. 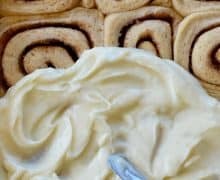 The only slight difference is in the texture, but otherwise the taste is spot on. So head on back for second and third helpings of this veggie-packed entrée or low carb side dish. 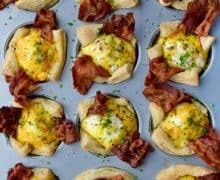 Best of all, you can customize it to suit your taste preferences by adding chopped chicken, leaving out the egg or lowering the fat with egg whites. 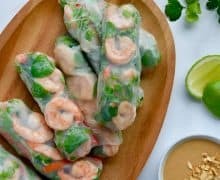 So skip the starch and load up on veggies with this healthy alternative to a Chinese takeout favorite! Add the cauliflower florets to a food processor and pulse just until the cauliflower resembles rice. (Do not overprocess it or it will be mushy.) 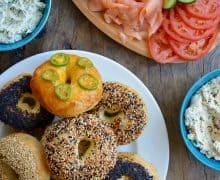 Set the cauliflower rice aside. Heat a large nonstick sauté pan over medium-low heat. Coat it lightly with cooking spray then add the eggs and cook until scrambled. Remove the eggs to a plate then add the sesame oil and olive oil to the pan and let it heat for 1 minute. Add the diced onion and garlic to the pan and cook, stirring, until the onion is translucent, about 3 minutes. 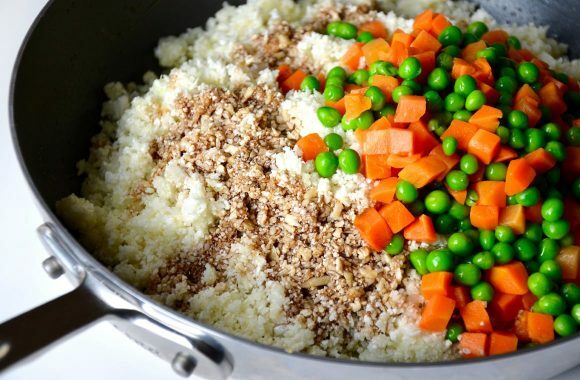 Add the cauliflower rice, peas, carrots, soy sauce, 1/2 teaspoon salt and 1/4 teaspoon pepper to the pan and cook, stirring, until the cauliflower is softened slightly, about 5 minutes. Return the scrambled eggs to the pan then add the diced pineapple and cook, stirring, for 2 minutes. 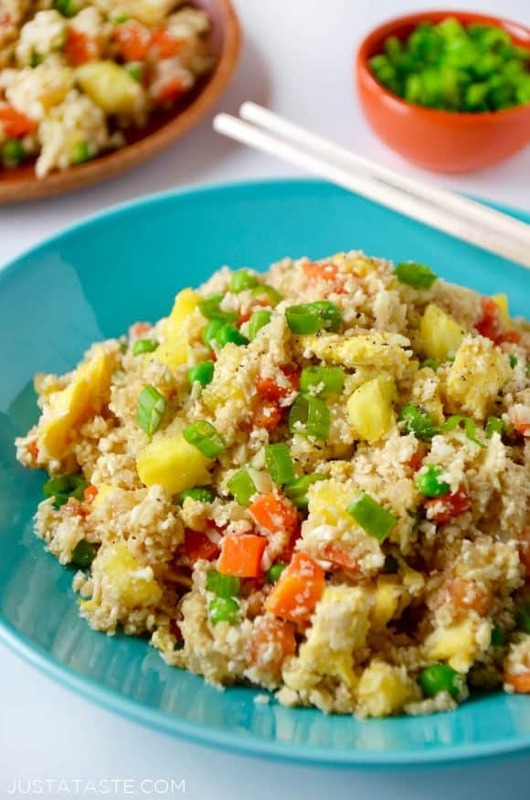 Garnish the cauliflower fried rice with scallions and serve. 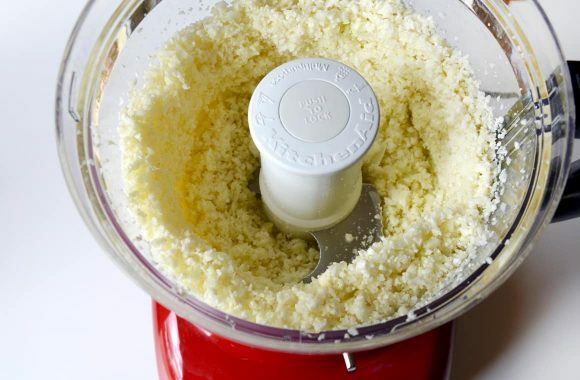 If you don't have a food processor, you can use the largest hole on the side of a box grater to grate the cauliflower into a rice-like consistency.